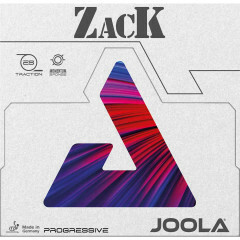 With the rubber Zack, JOOLA introduces a classic rubber made in Germany onto the market, designed specifically for all players who wish to do without an extreme catapult effect and extreme speed. Therefore it is a high-quality, all-round rubber, characterized by good control, placement accuracy and rotation tolerance. Outstanding durability and an extremely good value for money make the JOOLA Zack a rubber that enthusiasts of classic rubbers, produced with the most modern German technology, cannot afford to miss. Joola Rubber Zack is beeing added to cart.